He was actually kind of cute. Passengers aboard this plane needed no in-flight entertainment - like, say, a film starring Samuel L. Jackson - to be kept on the edge of their seats. They literally had a snake on the plane. 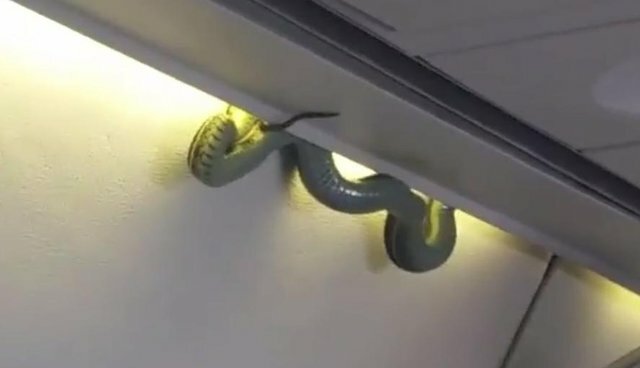 Footage posted online by Indalecio Medina, reportedly on a domestic Aeromexico flight to Mexico City, captures the alarming moment a snake began to emerge from a narrow space adjacent to an overhead compartment. Unlike some cinematic portrayals of similar situations, it's worth noting that the passengers aboard this snake-laden plane sounded quite calm and composed despite the cold-blooded stowaway's sudden appearance. That said, the flight was reportedly given priority landing at its final destination. Once on the ground, airport personnel were able to safely wrangle the snake. It's unclear how the snake got on the plane in the first place, but in a statement to Lopez-Doriga Digital, Aeromexico says it is investigating. Once the snake's species and origin have been determined, the airline indicated, he would be returned to his natural habitat.